Each year ODM make a celebratory pair of socks for Chinese New Year. Our design team wanted to do something really new this year and we held a product development brainstorm in mid July. 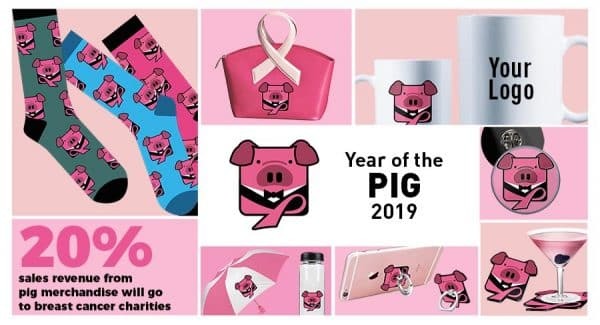 We’ve wanted to get more involved with charities and the pink pig is a natural tie in for Breast Cancer Awareness Merchandise. Our Monkeys floated on the clouds. Our Dogs had their Bone. Roosters posed on tree branches. 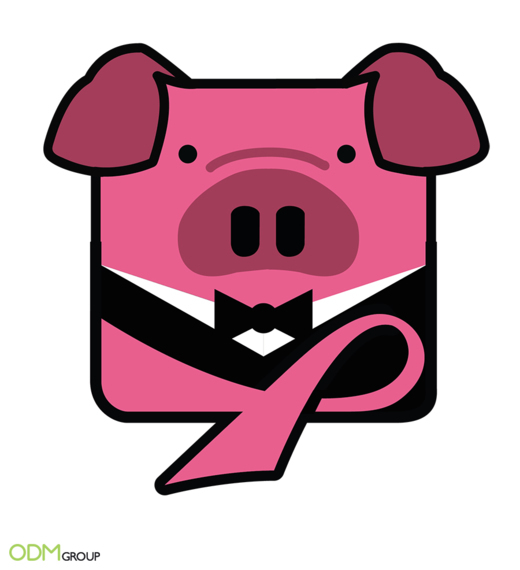 In 2019, our Smart pig wears a Tux to go to charity events and wears his pink ribbon with pride. The ODM Group will be sampling CNY-themed socks in August so contact us early and we will be happy to send out samples. We want to get onto retail shelves early and marketing managers are already planning campaigns for 2019. We are reaching out to past customers and introducing this a new concept. Our team of designers will be happy to tweak designs to help with any co-branding requirements. Mindsparkz will do all design work around this free of charge. Our Commitment: 20% of all sales revenue from Pig CNY merchandise will go to Breast Cancer charities around the world. Socks are only a starting point. More Breast Cancer Awareness Merchandise is being developed for launch over next few months. 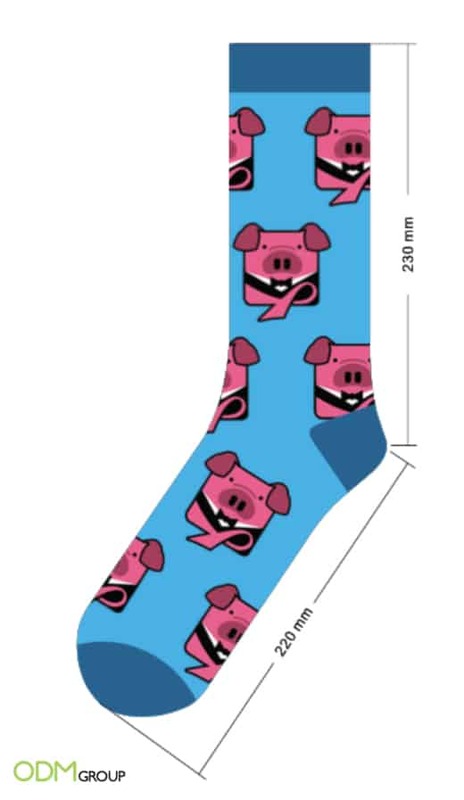 The socks we have designed for the previous CNYs include the monkey, rooster, and dog. They were madly popular and by the 12th year we are looking for a cult following. Check out our old blogs to see some of our previous socks. It all started with some Monkey Magic. The Rooster was fun and we did a follow up Green Colour run to tie in for St. Patricks Day. Our CEO may have pushed that one through. The Pug was inspiration for our Year of the Dog Socks. Year of the Dog Promotions – Our Chinese New Year Socks are Ready! Here is our Pig design and some other breast cancer awareness merchandise we are designing. How Does Breast Cancer Awareness Merchandise Support the Community? By wearing our pig and pink ribbon socks, it honors the survivors of the breast cancer disease. Furthermore, we are releasing other custom promotional merchandise for breast cancer along with our CNY pig and pink ribbon socks. By contributing to these charities, we are helping raise funds for great cause. We will leave our clients decide which charity to work with so this could benefit any number of foundations or charities, but all will be signed off by our management team and linked in our blog for complete transparency. The ODM Group has an ongoing project to produce breast cancer awareness merchandise, in support of the breast cancer community. Breast cancer is the most common cancer for women. It occurs when cancer cells collect, which becomes a malignant tumour. Although, it most commonly affect women, it can also affect men. It is important to raise awareness to know the signs and symptoms for a higher chance of successful treatment on its early stages. With ODM Group’s breast cancer merchandise, we hope to raise awareness, to encourage people to learn more and be educated about this matter. Please get behind us for the year of the pig.